We have recently attended IESE, Indonesia E-Commerce Summit and Expo 2016, an official event organized by the The Indonesian E-commerce Association (idEA). It was one of the biggest ever e-commerce expo in Indonesia, and probably Southeast Asia. Did you miss out? No worry, our photos journey here will take you a quick walk down the lane on what were going on there. 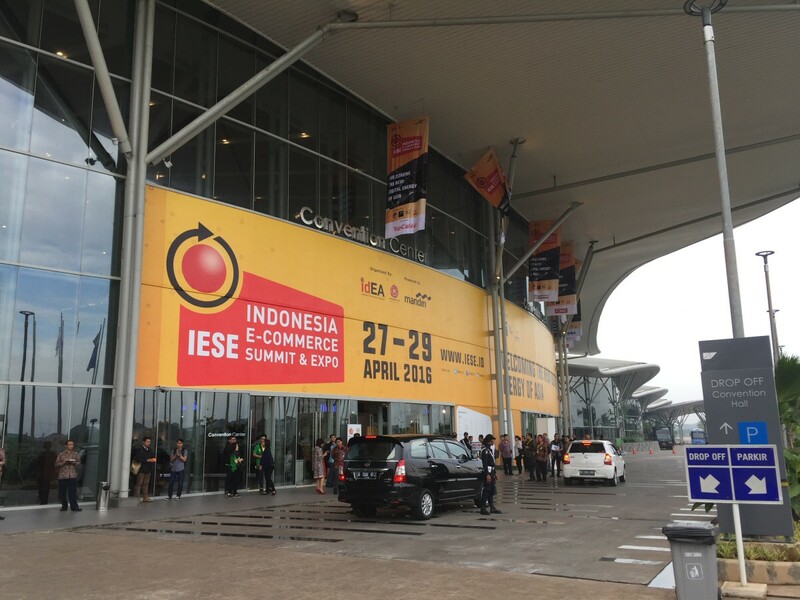 It is held at Indonesia Convention Exhibition (ICE) at BSC City, Tanggerang, about an hour trip from Jakarta Airport. 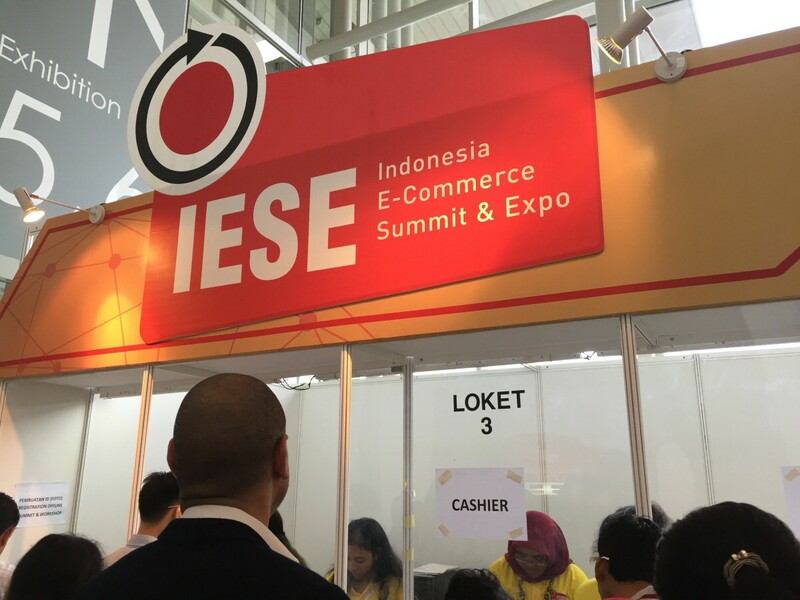 Ticket price for the 3-days IESE Summit was selling at 4.4 Million IDR (around US$ 333 or RM 1,300+), not exactly cheap. 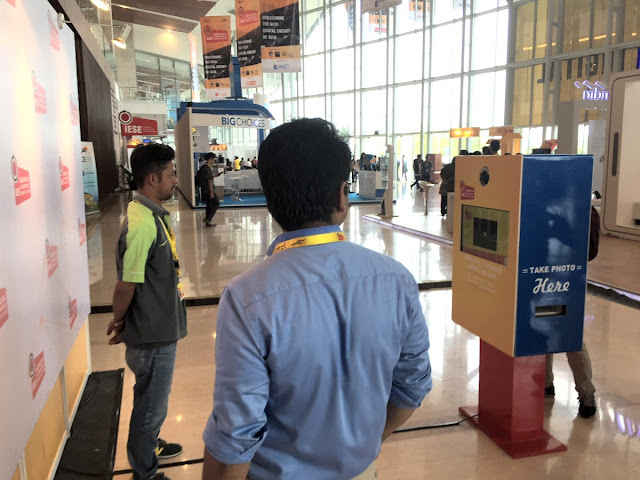 We all like selfie, so they put up a machine which shoot selfie (or wefie) for you and let you print out and take home as souvenir, neat! Of course, I got myself a selfie too! 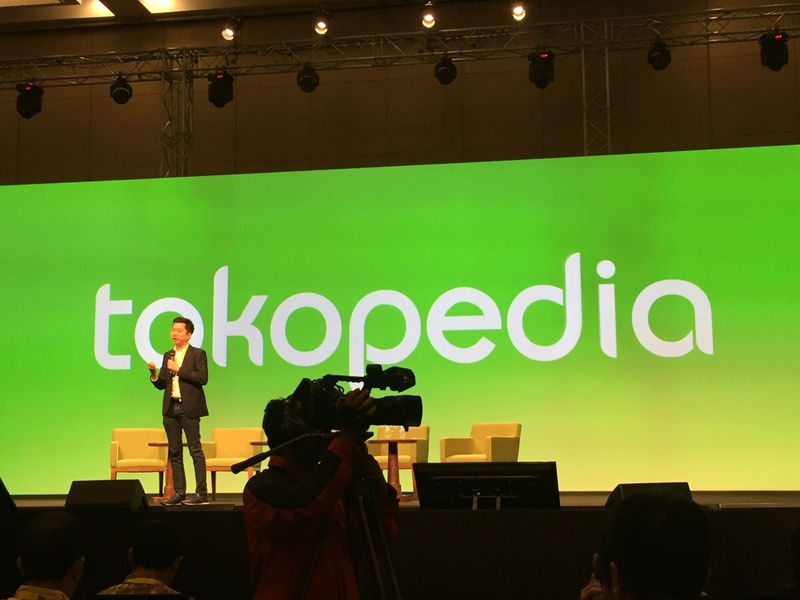 Meet William Tanuwijaya - the legendary co-founder of Tokopedia. 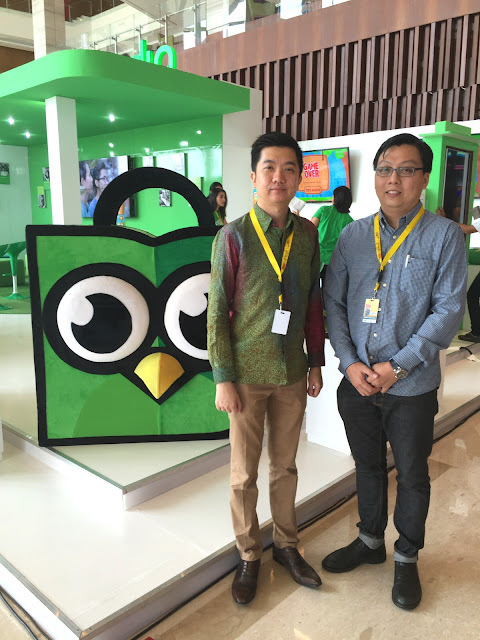 He admires Jack Ma and he aspire to make Tokopedia the 'Alibaba of Indonesia'. In 2015, Tokopedia had 300,000 active merchants, 6 million transactions a month which was growing at a rate of 10 ~ 20% month-over-month. 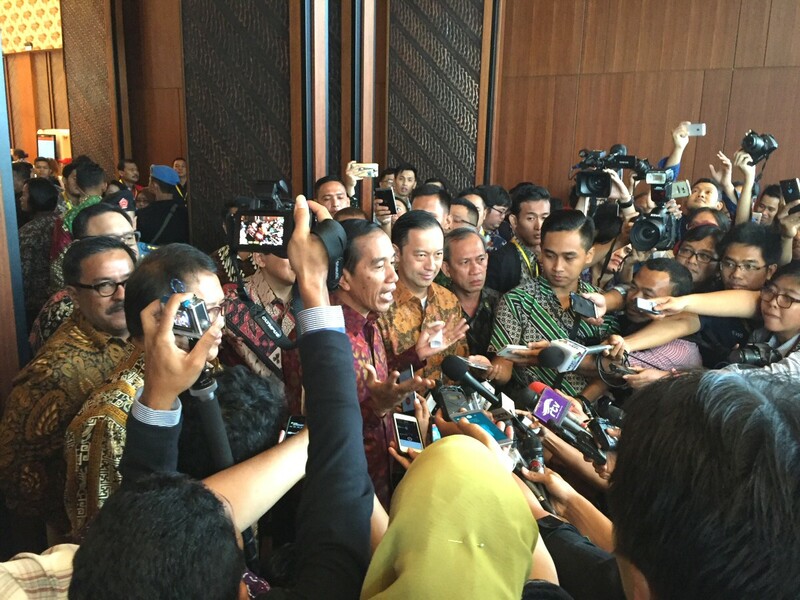 IESE 2016 was officiated by President of Indonesia, Joko Widodo. He was answering media questions (in photo above) after visiting the exhibition. 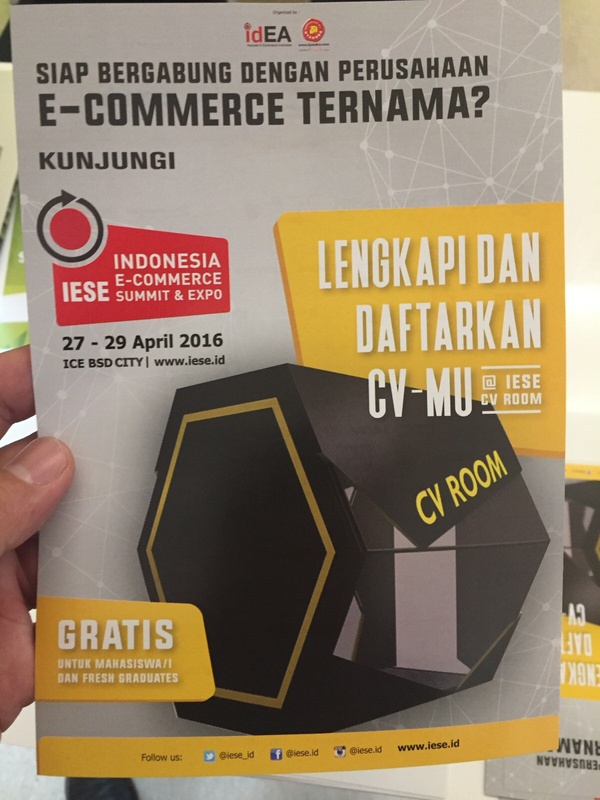 With the President spotted at IESE, it shows that Indonesia is very serious about becoming an e-commerce power house. Apart of laying down the future road map and key initiatives, Indonesia also plan to remove e-commerce from its negative investment list (which prohibits any foreign ownership in e-commerce related business). 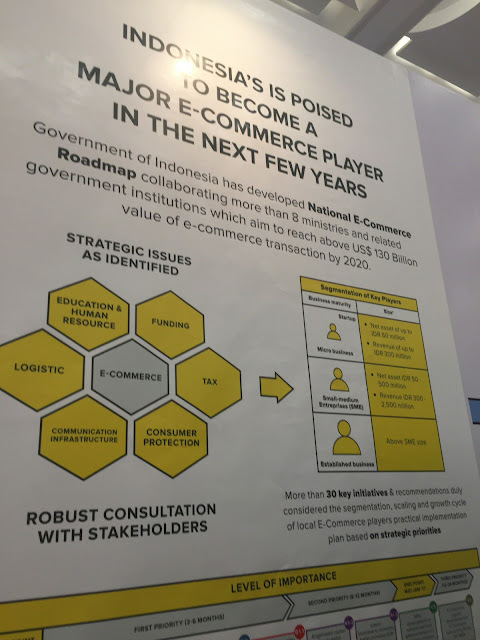 The National eCommerce Roadmap of Indonesia which aims for US$ 130 Billion e-commerce transactions by 2020 (yes, the year which Malaysia should achieve developed nation status). 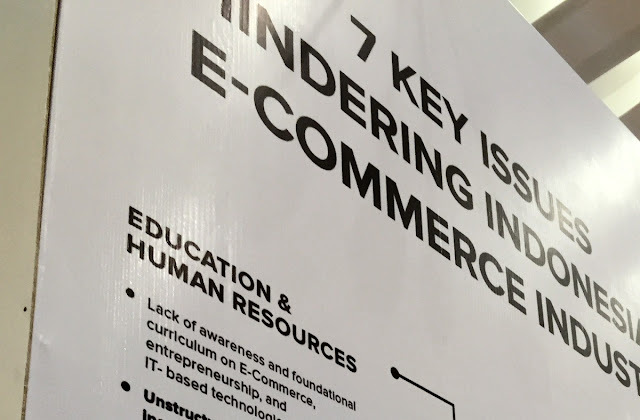 Of course, it is a bumpy road towards the big goal, thus they identify 7 Key Issues Hindering Indonesia eCommerce Industry and what will the government do about it. You can see that some of the same issues are being faced by other countries too. • Lack of awareness and foundational curriculum on e-commerce, entrepreneurship, and IT-based technological applications. • Unstructured & uncoordinated incubator programs. • Qualified talents being poached by offshore established players. • Limited access in the sourcing of expat leading talents. 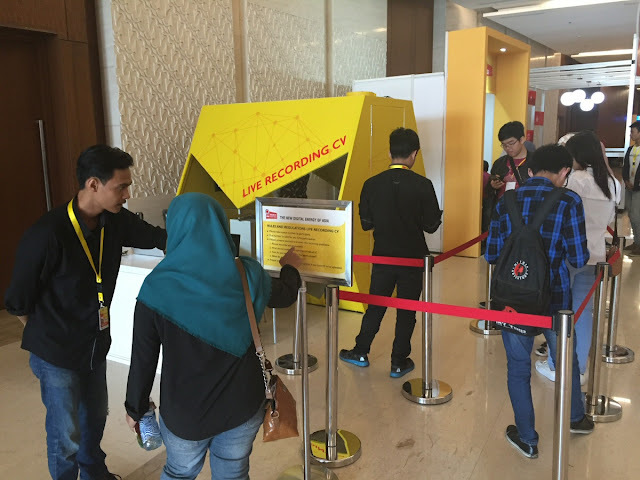 • IT engineering & computer science not being seen as lucrative career. • Lack of access to funding and financing schemes. • Limited seed investment by local investors and VCs. • Incompatibility of conventional loan schemes. • Burdensome tax / fiscal compliance requirement (VAT, CIT, customs, etc). • No taxation incentives & preferential schemes much needed by smaller players. 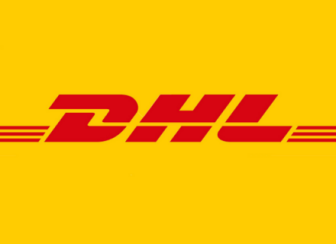 • High logistic costs due to inefficiency and infrastructure related challenges. • Lack of suitable logistic facilities to support e-commerce business models & operational needs. • Existing reach & penetration limited to major urban centers as dictated by available delivery options. • Low consumer trust on e-commerce business and lack of regulations to protect the industry players. • Lack of clear guidelines for e-commerce business registration, accreditation and certification. • Under-developed payment and transaction clearing system and gateways, thus, the heavy reliance on semi online real time payment system. • Lack of customer awareness about cyber security and crimes. • Lack of merchant participating on applying prudence, security and integration of Informtion technology systems; and securing control over the Electronic Transaction activities. • Lack of standard operating procedures that meet the user's data security control principles and Electronic Transactions. 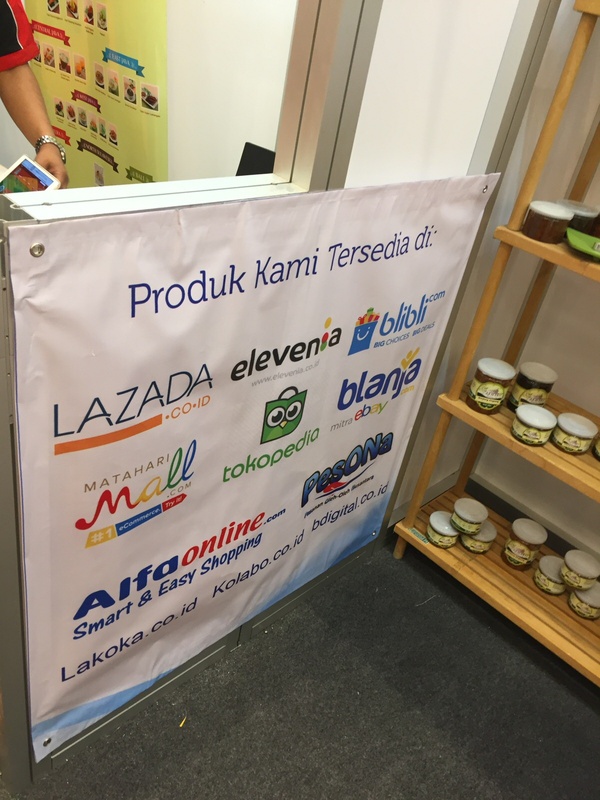 An Indonesian merchant spotted selling their products at all these marketplaces. Yes, multi-channel selling is going to be a major trend, as merchants will sell at any channels that will able to move their products. 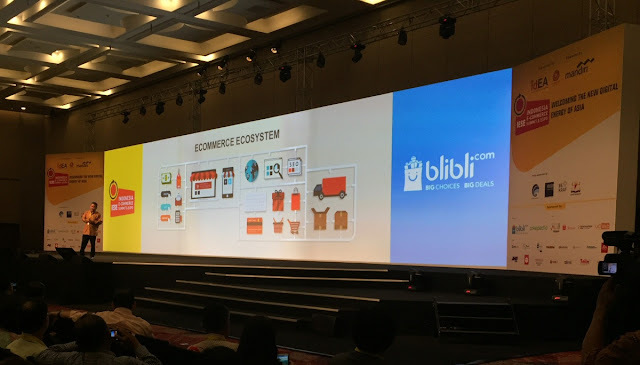 Blibli.com CEO Kusumo Martanto, shares Blibli.com future plan, and how Blibli.com is building the e-commerce ecosystem and empowering local brands to sell online. With Lazada (no booth spotted in the IESE exhibition) received investment from Alibaba Group, Blibli.com is planning to raise USD 75 million to bolster its logistic and distribution chain too. Daniel Tumiwa, Chairman of iDEA and also CEO of olx.co.id (OLX is an online classified sites, something like Mudah.my in Malaysia), delivers his opening speech during the second day of IESE. Liky Sutikno from INACHAM (Indonesia Chamber of Commerce in China), promoting china as one of the cross-border market for Indonesia entrepreneurs. His sharing was quite detailed and insightful. 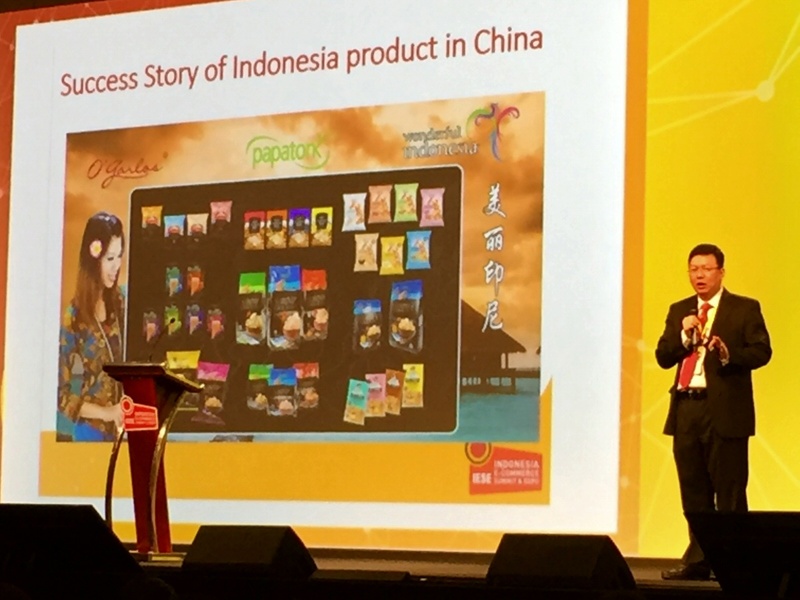 William, an e-commerce superstar in Indonesia, is inspired by Jack Ma and he has an ambition to build Tokopedia into Taobao version of Indonesia. In view of online shoppers are only 2% of Indonesia population, and online sales percentage as of total retail sales is below 1%, the opportunity is gigantic. Sudah Cek Tokopedia Belum? - a billboard on a cross-over bridge in Jakarta City. 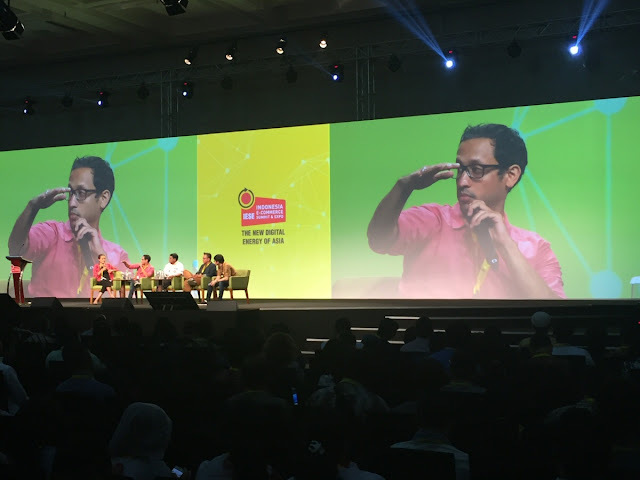 Andy Sjarif, co-founder of Nurbaya Initiative, he talked about the Indonesia's e-commerce irony! In my opinion, he's probably one of the most engaged, energetic and entertaining speaker in IESE. 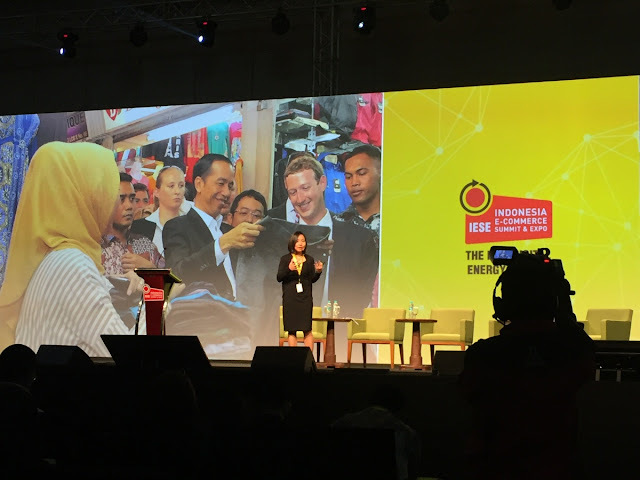 Nadia Tan, Head of Facebook SMB Southeast Asia. Did you notice the background photo of her slide? Facebook Chief was accompanying Indonesia Chief checking out products by Indonesia SMB. Definitely one of the best presentation photos. There are already 241 Million people on Facebook in SEA, and Facebook has just recently setup an office in Malaysia too! Taking Grab Bike to IESE from my hotel. If you are here, you really have to try out Grab Bike (yes, they will provide you free face mask), something that probably will never be available in Malaysia. 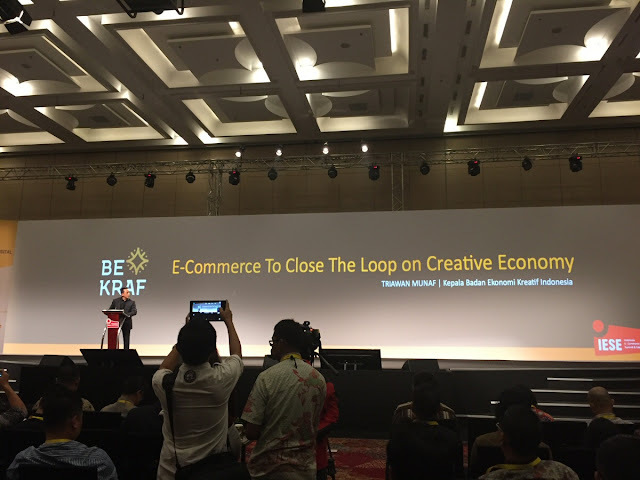 Triawan Munaf, Head of Indonesian Agency for Creative Economy, he mentioned e-commerce is an ultra fast vehicle for creative works to become a global play. See the hexagon box above? It is called the CV ROOM! This is where they get young graduates to record a 2 to 3 minutes live CV and pitch themselves to the e-commerce companies on why they should hire them! OK, so the colours shown in brochure is slightly different from the real thing. 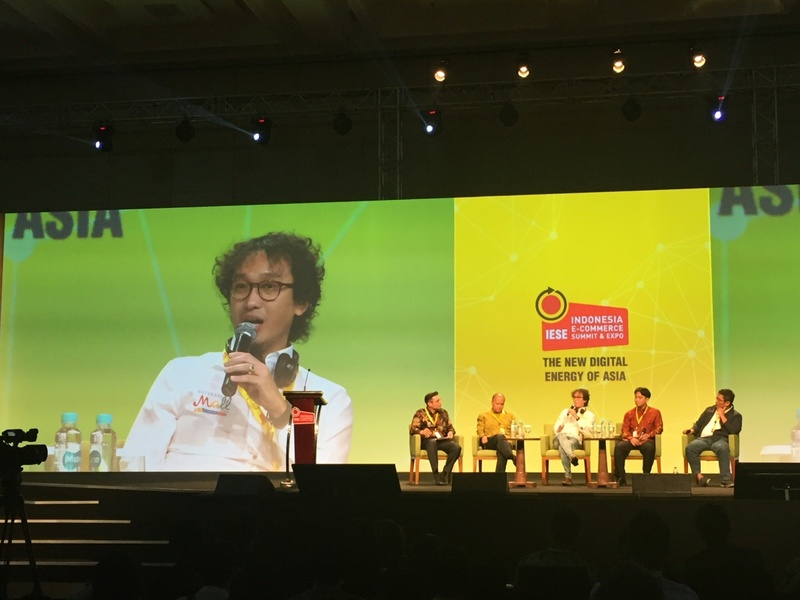 Hadi Wenas, CEO of Mataharimall (by Indonesia's conglomerate - The Lippo Group), mentions that fraud protection is required for merchants too, not just for the consumers. He is another superstar in the show, quite a number of people taking a wefie with him. Nadiem Makarim, CEO and Founder of GO-JEK, Indonesia. 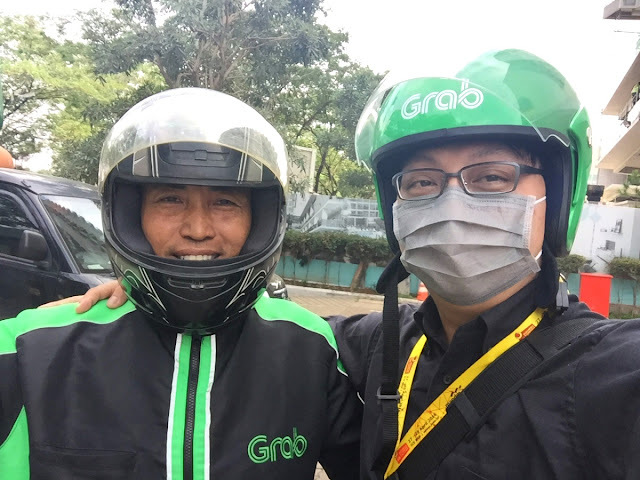 Another Internet superstar here, as almost everyone in Indonesia knows about GO-JEK. He was sharing as a panelist on "The Rise of Sharing Economy in Indonesia". He argues that sharing economy is good for the suppliers, He says for example, a masseur can earn up to 80% of the fee, vs if they work for a massage centre, they probably earn only 20% of what the customers are paying. 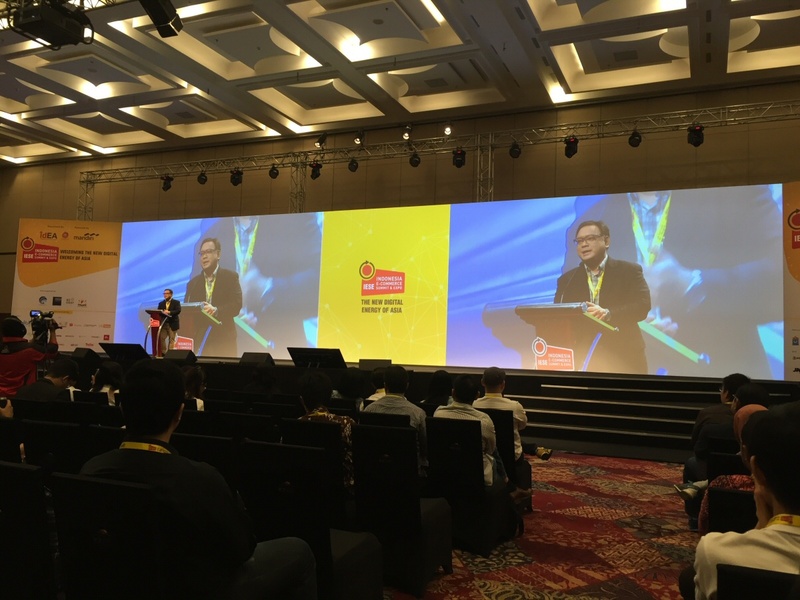 He also shares his journey building Go-Jek, it is like building something without knowing where you are heading as it changes every 6 months. The hardest thing he found thus far is managing the inter-connectivity of 3 parties for Go-Food, he need to deal with customers, restaurant owners and drivers. How to make all the 3 parties happy and grow in a scalable way is SUPER HARD! In summary, the event was beaming with hopeful, enthusiastic energy. 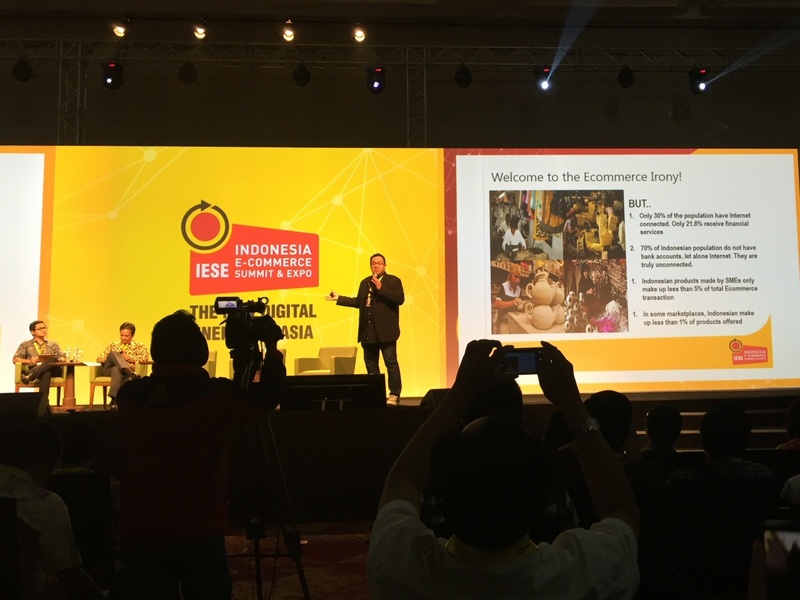 As one of the nation with largest population in the world, Indonesia's e-commerce industry is a sleeping dragon to awake! So this explains why hundreds of millions of investment are bring poured in by the VCs.